Start your Monthly Unlimited Membership to Upstart University! Get access to all that Upstart U has to offer for less than the cost of a few lattes a month when you sign up for a monthly subscription. 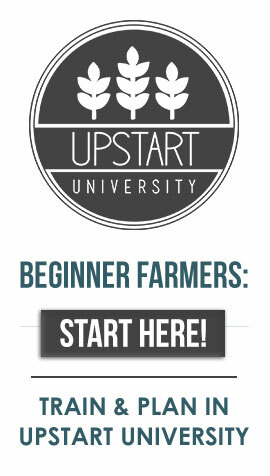 Upstart University is the leading online farming learning platform where industry experts help you plan, build, and operate a successful farm! Just $9.99 for your first month ($9.99 per month recurring payments). You’ll learn everything you need to know about starting a modern farm and you’ll have first dibs on other specials, promotions, and future product launches. The price for membership is $9.99 now, then $9.99 per month after that. Cancel anytime! See your cancellation & refund policy here. This membership does not include free access to downloadable course PDFs or other ebooks.